Does Your Computer Have a Virus, a Trojan, or Spyware? One of the more unfortunate aspects of being connected to the Internet these days is the likelihood of having your computer become infected with spyware, a virus, a Trojan, or some type of adware. The threat is real, especially if your computer isn't properly protected. Fortunately, there are strategies that you can use to detect such malicious applications along with removing them from your computer. Perhaps one of the first signs that your computer might be infected is poor computer performance. Is your computer acting sluggish lately? Are pop ups suddenly appearing all of the time when you access the Internet? Are your searches taking you to web pages that are unrelated to your search question? Is your computer failing to boot up all of the time or lagging when you attempt to use it? Are you unable to access your hard drive? Is you computer making funny noises all of a sudden? Are the filenames changing without any input from you? If one or more of the answers to these questions is yes, then your computer might be the unwitting victim of a drive by infection by a virus, worm, Trojan, or form of spyware. A computer virus is a software application that infects the computer with malicious intent. Viruses are generally designed to spread from one computer to another, quite often silently and secretly. In fact, by the time most individuals realize that a virus has infected their computer, a great deal of damage has been done. Viruses can perform any number of harmful activities that range from minor annoyances to the complete wiping of your hard drive. A Trojan is another of the forms of malicious software that can infect a computer. This type of executable file often brings other viruses or spyware applications along with it. Trojans are capable of many undesirable functions including data mining, hacking, and infecting the computer with additional spyware and adware. Trojans can install harmful software on your computer, creating even more problems than an ordinary virus in some cases. Worms are variations of computer viruses. Worms can self-replicate and spread from your computer to other computers sending identical copies of itself on a regular basis. Typically this activity occurs through email transmissions. Typically, the greatest problem with worms is that they can use up your Internet bandwidth, leading to poor computer performance. Spyware is a type of software application that also infects a computer without announcing itself. Typically, spyware is designed to monitor the computer user's activity or "spy" on their computer usage. Spyware generally gathers information about the individual's use of the Internet in order to assist with advertising practices. Adware is a type of software application that is responsible for those pesky ads that continually pop up whenever you connect to the Internet. Adware often attaches itself to your computer through website usage. Quite often, viruses enter the computer via email attachments, ordinary web pages, or instant messaging texts. It is often difficult to recognize a virus as such because it arrives disguised as a friendly attachment such as a greeting card or image. 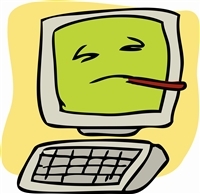 Viruses can also enter a computer via an Internet download. In some cases, simply clicking on a particular website will install the virus onto your computer. It is important to understand how a virus gets onto your computer so that you can practice caution and try to avoid them in the future. Installing a reliable anti-virus/anti-spyware application is one of the best ways to protect your computer from the damage that malicious applications can inflict on your computer. However, since viruses are constantly undergoing modifications made by their authors or creators in order to avoid detection, your anti-virus/anti-spyware application must be updated on a regular basis in order to remain current with possible threats and effective in its task. In order to protect your computer, you can also pay attention to certain triggers that suggest the potential for harm exists. If a website or email attachment looks suspicious, avoid it. Don't open any suspicious looking emails, especially if you don't know the sender. Even if you do know the sender, you should avoid opening unexpected attachments. Instead, contact the individual with a newly composed email and ask them if they sent anything to you. Certain websites attempt to clone legitimate ones in an effort to place spyware on your computer for the purposes of "data mining," a process through which your personal information is stolen from your computer. Other strategies involve updating your operating system whenever new updates come out. Typically, some of these updates will include security patches. Additionally, computer users should install a firewall to provide extra protection against malicious types of software. I think that contrary to all the Computer Boffins and Anti Virus Companies denying it....these gremlins are not a creation only made by Computer Hackers and Nerdy/Geeky people determined to create Havoc. Doesn't it make sense that there are Anti Virus Business's out there creating these things and infecting the net/emails etc...purely for Sales purposes...? How else can they stay in Business.?? It is high time that the Law Enforcement Authorities and Fraud Squads and other austere Authorities looked seriously at this problem and did some deep undercover, if necessary, investigations.The results should be made Public. I invite more comment from the Public..as ,"you can fool some of the people some of the time...but not all of the people ALL of the time.!! "